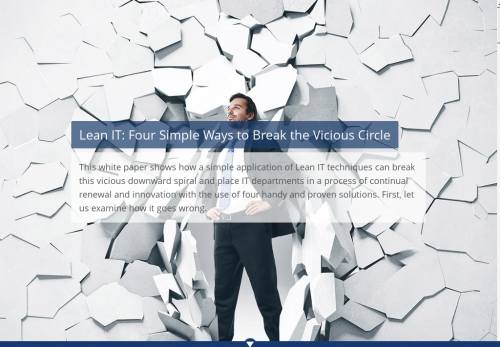 This white paper shows how a simple application of Lean IT techniques can break this vicious downward spiral and place IT departments in a process of continual renewal and innovation with the use of four handy and proven solutions. First, let us examine how it goes wrong. The digitalization of the value stream and Internet Technology has unleashed a tsunami of simultaneous changes that have come crashing onto the shores of business. Organizations big and small, in almost every branch and sector of industry, have been dragged out to sea, never to be heard from again. No surprise then that almost everyone is having a close look at their business model. Feeling a need to urgently respond to the market, they burden themselves with high volumes of projects, demanding ever more hours from their middle management and the work floor. There is no time for rationality or a holistic view of the work. As a result of the headlong dash, the processes become ever more muddy, clogged and sluggish, thereby deepening their troubles. Many IT organizations are aware their output is too low. Projects overrun in terms of time and budget and often change unpredictably in scope. They become ever more complex due to variables from other projects and competing ERP systems. This is usually dealt with by bringing in external IT experts, which sounds like a great solution, but in reality it often just muddies the waters. Why? Because this often leads to unreasonable expectations. It’s not uncommon for a company’s business arm to prematurely assume the IT department has gotten its house in order and thinks, “Time to demand quicker delivery!” They also sometimes have the false impression they can buy functionalities like picking desserts off a cafeteria display. We already indicated that projects often overrun. This, among other things, is due to a lack of progress transparency. The symptoms of this situation are easily recognizable: • Almost no one, not ever the work floor, has a real idea of the project’s progress; • The focus is on project management rather than on the end result; • Many managers simply don’t have the knowhow to manage a portfolio of many competing projects.As a business grows, so does its IT department. The growth also means other project groups, teams and forums get involved and demand their say, clogging up the decision-making process. Simplifying decision-making structures, and their relevant processes, is as crucial as it is unpopular. Many will inevitably be excluded from taking important decisions. Most people don’t want to burn their fingers trying to get this done and turn to outside consultants for support. However, these consultants tend not to be available during the operative phase, leaving everyone confused when unexpected situations arise and the decision making structure isn’t clear. IT fails to be satisfactorily available. A deeper look reveals the quality of service leaves a lot to be desired. While incidents and errors are inevitable, many IT departments are stuck in a cycle that lacks a philosophy of self-improvement. Incidents become the norm, rather than the exception. Projects overrun due to a lack of transparency. The poor service and constant overruns inevitably lead to a delayed project delivery. The business arm is usually involved at the start and delivery of a project, but not in the middle. This interval is too long. IT organizations usually deliver what has been asked of them, but much too late. The business arm of a company hands its clearly defined product to the IT department and subsequently moves onto other priorities right up to the point of delivery. In the meantime, the market is dynamic and the product has become obsolete. This is why keeping an eye on market developments should always weigh heavily through the entire production of a project; not incorporating new insights leads to missed chances unnecessary costs. The exponential growth in the number of ongoing projects, exponentially increases the complexity of the decision-making process. Ever hear a manager say they have plenty of time to get things done? Probably not. Mangers work exceptionally long days, meet for many hours and have little time to really keep up with developments on the work floor. This is not out a lack of interest, but rather the result of the vicious cycle. Their schedules are are so bursting at the seams with escalated project issues and urgent decisions that they are forced to prioritize out time to study new ideas. This raises important questions: if managers have so little time for reflection, to ask questions and to interact directly with the work floor, what does this mean for the quality of decision-making in the short and, if the situation doesn’t change, long term? And why is it that fewer decisions are made on the work floor and more decisions fall to management? Now that we have mapped out the five most common challenges, it’s time to look at how we can break this vicious circle. This measure is based upon the well-known phenomenon that it’s easier to deal with smaller chunks of work. Moving five small stones is much lighter than shifting a big, heavy one. The concept of the assembly line is also based on the idea of continual small additions to the product. Big block work is, for example, made of large programs and sizable projects that, as a result of their complexity, are difficult to plan. There are so many stakeholders involved that creating and translating clear goals into a shared vision within the organization is extremely difficult. This is especially difficult in a situation where goals and outside developments are in constant flux. Lean way of working allows each chunk to be be completed in a shorter period of time. Smaller chunks means greater visibility of the entire project allowing for greater harmonization or “flow” of all the steps in the process. This speed of the work (demand) can be adjusted to fit the available capacity (supply). The result is less waiting time and fewer peaks and troughs in the workload. “Slicing and dicing” is particularly suited to complex IT projects projects that have no clear resolution. The needs of the project are spread out into a number of steps, from coarse to fine, which are then iteratively resolved. Think of the way a painting is built layer upon layer, starting first with a sketch, then a rough draft, finishing with a final, refined result. Here’s a familiar scene: a messy office. There are files piled up all over the desk and floor. The trash bin is overflowing. It looks bad. Time to get organized, but where to start? Which files matter the most? What has priority and what can wait? IT organizations face the same decisions every day. There are too many projects of equal importance running simultaneously. Attention and manpower is so fragmented that all the projects end up with a delayed overall time to completion. Trying to coordinate is all leads to an explosion in meetings which leads to a portfolio board working on a cross-project basis. Project managers get an additional reporting line giving managers yet another request to meet. A large volume of work in progress leads to complex work controls and decision-making processes, which in turn creates a further reduction of operational capacity. It spirals on and on. This happens by closing incidents that have been open too long. Place regular and project-based work on a board. Divide it into two parts: ‘Running the Business’ and ‘Changing the Business’.Under ‘Running the Business’ we place daily operations, including all of the regular processes. Create a continual flow of small chunks of work The Lean IT perspective results in a radical reduction of work in progress 4 Quint Wellington Redwood Quint Wellington Redwood ‘Changing the business’ contains all the initiatives, such as programs and projects that innovate the organization. Teams and managers frequently discuss (on a daily and weekly basis) the status with one another and make decisions about problems and bottlenecks. This is the very essence of visual management: effective, short-cycle adjustments. We’ve gone too far slicing the value chain up into numerous departments or specialist groups that deliver little. Each and every department reviewing the incoming plans ask themselves, ‘Does this work belong to my department?’ ‘Is the call complete?’. If the answer is no, and that happens more often than one might think, then this is the beginning of the ever familiar ping pong of work between departments. In the end, the conflicting priorities means no one thinks they’re responsible for the end result. The Lean way of thinking proposes to simplify the organization of the value chain. Reduce the number of departments and concentrate responsibility into fewer hands. Lay responsibilities as far down the organization as possible. Reduce the decision making process in order to clarify who is responsible for what. The number of managers and coordinators is going to decrease and this won’t happen without resistance. Leadership from the top is necessary to get horizontal integration moving. It’s also important to restore or enhance vertical integration: that is to say, the manner in which the various layers of management work with one another. The speed and thoroughness with which these layers mutually coordinate is essential for securing flow in the operational process and agility of the organization. Optimization of the value chain also means improving the management cascade. In practice, this means the meetings change structure to ensure they are optimally planned. Every decision maker on every level comes to the meeting. The purpose of this is a complete weekly “roll up from work floor to the top and then back down”. This is a quick and effective way to exchange information. This makes each meeting more effective and reduces the number of meetings. Reduce the number of silos in the value chain. By agreeing to work with hard and fast principles, employees will react in a clear manner to situations that have lost control. They’ll break the work into smaller chunks, thereby creating more flow in the processes. They will also work with more purpose and be more productive because there will be less work in progress to maintain. Thirdly, management will spend more time on the work floor as the number of meetings has been reduced. Lastly, in this era of “short time to market”, there will be a reduction in turnaround time in the processes of the value chain. This also means less need for coordination. Breaking a vicious circle and creating a virtuous circle seems extraordinarily difficult, especially when its your company caught right in the middle of a downward spiral. Lean IT offers a solution that can return an IT department to a path of efficient, forward thinking renewal, in a market that merciless punishes those who fail to do so.